Processors are at the core of the Auditory front-end. Each processor is responsible for an individual step in the processing, i.e., going from representation A to representation B. They are adapted from existing models documented in the literature such as to allow for block-based (online) processing. This is made possible by keeping track of the information necessary to transition adequately between two chunks of input. The nature of this “information” varies depending on the processor, and we use in the following the term “internal state” of the processor to refer to it. Internal states and online processing compatibility are then assessed in processChunk method and chunk-based compatibility. A detailed overview of all processors, with a list of all parameters they accept, is given in Available processors. Hence this section will focus on the properties and methods shared among every processors, as well as the techniques employed to make processing compatible with chunk-based inputs. As for signal objects, processors make use of inheritance, with a parent Processor class. The parent class defines shared properties of the processor, abstract classes that each children must implement, and a couple of methods shared among children. The motivation behind the implementation of these methods is probably not clear at this stage, but should appear in the following sections. Many of these methods are used in the manager object described later for organising and routing the processing such as to always perform as few operations as needed. These properties are populated automatically when using the Auditory front-end by the manager class which is described later in Manager. All of them, apart from Type are implemented as Hidden properties as they should not be relevant to the user but still need public access by other classes. To these two listeners mentioned above correspond two events, hasChanged and isDeleted. These events are used in connection to feedback as a mean to communicate between processors. When parameters of a processor are modified, it will broadcast a message that will be picked up by its upper dependencies which will then “know” they have to react accordingly (usually by resetting). Connecting events and listeners is done automatically when instantiating a “processing tree”. Modifying a parameter is done via the modifyParameter method which will broadcast the hasChanged message to upper dependencies. out = pObj.processChunk(in), the core processing method. Returns an output out given the input in. It will, if necessary, use the internal states of the processor (derived from previous chunk(s) of input) to calculate the output. These internal states should be accordingly updated in this method after the processing was performed. Next sub-section provides more details regarding these internal states. pObj.reset, that clears the internal states of the processor. To be used e.g., in an offline scenario in between two different input signals. getCurrentParameters returns a structure of the parameter values currently used by the processor. initiateProcessing: Calls the processing method, appropriately routing inputs and output signals to the input and output arguments of the processChunk method. As briefly exposed above, exact computation performed by each processors are taken from published models, and are described individually in Available processors. However, most of the available implementations are for batch processing, i.e., using one whole input signal at once. 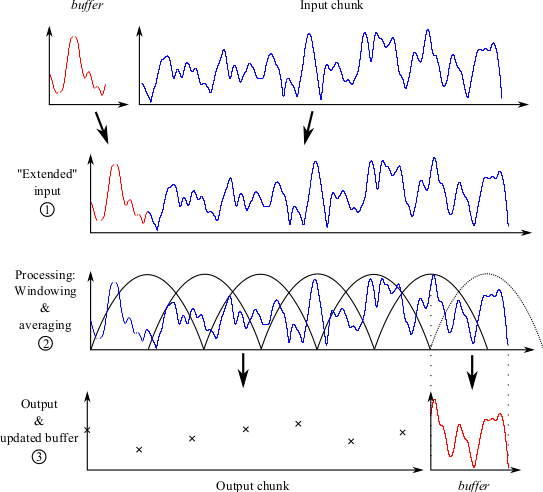 To be included in the Auditory front-end, these implementations need to be adapted to account for chunk-based processing, i.e., when the input signal is fed to the system in non-overlapping contiguous blocks, or chunks. Some processors rely on the input only at time t to generate the output at time t. These processors are then compatible as such with chunk-based processing. This is the case for instance for the itdProc which given cross-correlation deduces the . That is because the processor, at time t, is provided a cross-correlation value as input (which is a function of frequency and lag), and only locates for each frequency the lag value for which the cross-correlation is maximal. There is no influence of past (or future) inputs to provide the output at time t. This is unfortunately not the case for most processors, which output at a given time will be influenced, to different extent, by older input. However, so far, all the processing involved in the Auditory front-end is causal, i.e., might depend on past input, but will not depend on future input. The buffer is appended in the beginning of the new input chunk. Conceptually, this provides also a chunk of the input signal, but a longer one that starts at an earlier point in time. The input extended in this way is processed following the computations described in literature. If the input is required to have specific dimensions in time (e.g., when windowing is performed), then it is virtually truncated to these dimensions (i.e., input samples falling outside the required dimensions are discarded). The goal is for the output to be as long as possible while still being “valid”, i.e., not being influenced by the boundary with the next input chunks. If additional output was generated due to the appended buffer, it is discarded. The buffer is updated to prepare for the next input chunk. This step can vary between processors but the idea is to store in the buffer the end of the current chunk which did not generate output, or which will influence the output of next chunk. A practical example to better illustrate the concepts described above is given in the following. The rate-map is conceptually a “framed” version of an IHC multi-channel envelope. The IHC envelope is a two-dimensional representation (time versus frequency), and the rate-map extraction is the same procedure repeated for every frequency channel. Hence the following is described for a single channel. To extract the rate-map, the envelope is windowed by a set of overlapping windows, and its magnitude averaged in each window. This process is adapted to online processing as illustrated in Fig. 16. Fig. 16 Three steps for simple online windowing, given a chunk of input and an internal buffer. The internal buffer (which can be empty, e.g., if first chunk) is appended to the input chunk. This “extended” input is then processed. In that case, it is windowed and the average is taken in each window. The “valid” outputs form the output chunk. Note that the right-most window (dashed line) is not fully covering the signal. Hence the output it would provide is not “valid”, since it would also partly depend on the content of the next input chunk. Therefore the section of the signal corresponding to this incomplete window forms the new buffer. Note that the output chunk could in theory be empty. If the duration of the “extended” input in step 1 is shorter than the duration of the window, then no valid output is produced for this chunk, and the whole extended input will be transferred to the internal buffer. This is unlikely to happen in practice however. The processing performed by the Auditory front-end often involves filtering (e.g., in auditory filter bank processing, inner hair cell envelope detection, or amplitude modulation detection). While filtering by FIR filters could in principle be made compatible with chunk-based processing using the principle described above, it will be impractical for filters with long impulse response, and in theory impossible for IIR filters. For this reason, chunk-based compatibility is managed differently for filtering. In Matlab’s filter function, the user can specify initial conditions and can get as optional output the final conditions of the filter delays. These take the form of a vector, of dimension equal to the filter order. In the Auditory front-end, filters are implemented as objects, and encapsulate a private states property. This property simply contains the final conditions of the filter delays, i.e., its internal states after the last processing it performed. If applied to a new input chunk, these states are used as initial condition and are updated after the processing. This will provide a continuous output given a fragmented input.